We offer you a trip round the myths, legends and mysteries of the city of Naples, a melting pot of different religions and races and therefore a cradle of cults and popular traditions which are often rooted in mythology. It is a city in which culture, art and "light" mix with the obscure darkness of a hidden, submerged, underground world. Our "Discovering the Mysteries of Naples" is intended as an introduction to the myths, the mysteries and the darker sides of the city which are part of the perceptible and hidden fabric of the city which you cannot ignore if you want a proper vision of Neapolitan history. We start with its origins in the myth of the Siren Parthenope and proceed through the Isis stories and the cult of the god Mithras, taking in the so-called "talking statues" on our way, until we get to the miracles, the cult of the dead, the great mystical characters like the Prince of Sansevero, or those who changed the face of the city thanks to their revolutions like Masaniello and Eleonora Pimentel De Fonseca, and we end up with the ghost stories, munacielli, belle 'Mbriane and paranormal phenomena. 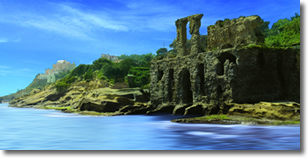 Edited by Servizio Programmazione e Progettazione Grandi Eventi of the Municipality of Naples.